CF Verification IP provides an smart way to verify the Compact Flash operations. The SmartDV's CF Verification IP is fully compliant with revision 1.0/2.0/3.0 and 4.0 of the CF Specification and provides the following features. Supports Compact Flash Specs 1.0/2.0/3.0 and 4.0. PC Card ATA using I/O Mode. PC Card ATA using Memory Mode. Supports Security Mode Feature set. Supports Power Down Commands and Sleep mode. Supports for CRC for UDMA Operations. Supports Host and Device Initiating, Terminating, Pausing, Sustaining Ultra DMA Mode Data In/Out Burst. Supports True IDE Mode I/O Transfer Functions. Protocol Checker fully compliant with CF Specifications. 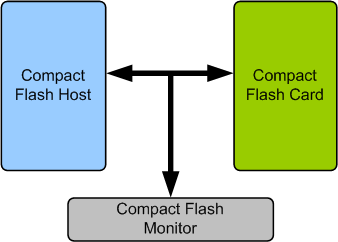 Compact Flash Verification IP comes with complete test suite to test every feature of CF specification. Faster testbench development and more complete verification of CF designs. Easy to use command interface simplifies testbench control and configuration of Card and Host. SmartDV's CF Verification env contains following. Complete regression suite containing all the CF testcases.